Crabby Cook: Pressed Sandwiches Are Like Ogres, They Have Layers. Pressed Sandwiches Are Like Ogres, They Have Layers. When I first started this blog about the only people who visited were friends and family. Now, with an archive of posts building up, Crabby's appearance on some food forums, and the occasional spotlight on a food photo site, I've built up a small following. That doesn't mean I've forgotten my roots. Back in the beginning, one of the requested recipes was for "The Sandwich". Years ago I saw this on some cooking show (Martha Stewart I think). It struck me as the perfect picnic, boating, big crowd sort of meal. 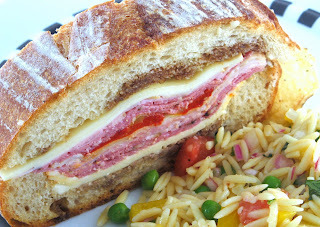 For CrabCakes 1 & 2 the appearance of this sandwich is a signal that either summer's here or there's going to be a party. In truth this is not so much a recipe as it is a technique. 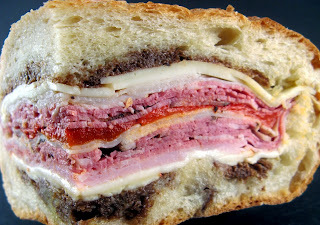 The closest "named" sandwich I can find is a Muffaletta, and there are enough differences that it's not a fair comparison. You can be as creative or meek as you like. In truth, because this sandwich stews overnight, you're actually better off being really daring. The only catch is that it has to be made a day ahead and then "pressed" overnight in the refrigerator. But then the next day all you have to do is pack up and hit the road. This recipe makes enough for two sandwiches. 2 Loaves of crusty, soft-centered bread. Crusty is important. 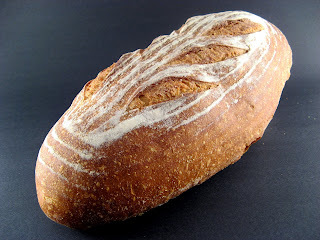 A bakery loaf of Italian Bread works well, though I've done it with Ciabatta, Country Wheat, and a French Round. In a medium bowl combine the balsamic vinegar and olive oil. Season with salt and pepper to taste, roughly 2 teaspoons pepper (alot on purpose) and 1/2 teaspoon of salt. The point here is to make a balsamic vinaigrette. Now, take your two loaves of bread and slice them in half horizontally. That's right horizontally. We are going to make one huge sandwich out of a single loaf of bread. Separate the two halves, then very carefully, remove the soft inner portion of the loaf. You are trying to create a hollow into which we will stuff the meats, cheeses and condiments. The key here is to leave some of the soft inner part. If you go all the way to the crust the vinaigrette won't get absorbed. Step 1. Spread a quarter of the vinaigrette onto each of the four bread halves that you have created. Next, layer some cheese, in this case 4 slices of Provolone, onto the bread. Now place a layer of each type of meat on top of the cheese. You are half way done. At this point you should have half of your meats and cheeses remaining. At the middle level, put on a layer of roasted red peppers and some of the hot pepper relish. If there is a drizzle of vinaigrette left, add it here. Now recreate the layering that you did the first time, finishing with a final layer of cheese (If I started with Provolone then I like to mix it up and finish with the Muenster). 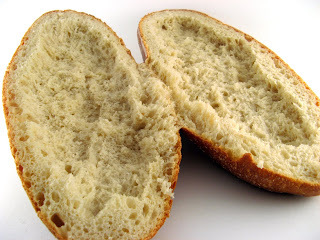 Put the top of the bread loaf onto the sandwich and lightly press down. Now the interesting part. Lay out sheets of plastic wrap approximately three feet long and six inches wider than the loaf of bread. Place the loaf at one end of the plastic wrap and while pressing firmly on the sandwich roll the loaf into the plastic wrap. The key here is to keep the pressure up and let the plastic wrap hold the sandwich tight. If you've done this part correctly you should have a solid loaf of bread neatly wrapped in plastic. Put the sandwich in the refrigerator and place a weight on top. A gallon of milk does a good job, though if you have a brick lying around that would work too. Leave it in the fridge overnight. The point of this pressing is to meld the flavors and distribute the vinaigrette and brine from the peppers and relish throughout the sandwich. The next day, remove from the refrigerator, slice and serve. Prepare yourself for the adulation. You can try many different ingredients in this sandwich. The mixing of the flavors gets people to try things they wouldn't normally go for, for example: try slicing a round of Brie as one of the cheeses, use diced, pitted olives in a layer, use artichoke hearts as the a layer, and fresh mozzarella always works (it really absorbs the flavors of the sauce). The oily vinegary layers are key to the success of this sandwich. It's OK to add mustard, but what will keep your guests raving is the virtual salad dressing that is formed by pressing all these flavors together. There it is, "The Sandwich". Easy, no cooking, but some assembly required. Try one for your next outing, you will not be sorry. Until next time, you can do it, you can cook. Crabby this looks amazing. I am drooling. I always have 'stuff' in the fridge. I also bought some very good Balsamic at the food show. What a great way to use left overs. I'll have to second that, I am a big fan of unique sandwiches, this one definitely fits the bill. Have you ever used seafood in it, some lump crab I think would absorb alot of the flavors. One of the greatest things about this sandwich is that it changes every time you make it. I've never tried it with seafood but I don't see why crab or tuna with some lemon pepper wouldn't work. I suspect you could make a great vegetarian version with things like roasted eggplant, marinated artichoke hearts and fresh lettuces. You're really only limited by your own creativity. Love this sandwich!! Looks amazing! Yippee - the sandwich! Glad to see you remembering the fam Crabby and not just your new global foodie pals! This sounds super-flavorful! Normally, I'm trying to keep the moisture *out* of my pressed sandwiches, but you've just reminded me that there definitely are situations where it would be fantastic if something like a balsamic vinaigrette were to soak into the bread. Looks terrific! Crabby, this sounds and looks absolutely delish. I think it'll be making an appearence in the daily lunchboxes!! Classic white wine match is a German Riesling of the Kabinett level around 10 a bottle. Classic red wine match is Beaujolais, served slightly chilled this time of year, and nothing older than 2005 and NOT Nouveau this time of year. For those of you who love to look for the obscure, try to find a Northern Italian red wine made with a grape named St. Magdelener. The label will look German as this is from the Italian Alps near the Austrian border. Finally -- the sandwich! Thanks, Crabby.